Stock Exchange: Extreme Market Strength, What Does It Tell Us? provide a few (minority) reactions from fundamental analysts. We also have some fun. We welcome comments, links, and ideas to help us improve this resource for traders. If you have some ideas, please join in! Our previous Stock Exchange asked the question “what can traders learn from poker playing artificial intelligence?” We compared the strengths of machines versus humans with regards to poker, and then discussed their applications to trading. If you missed it, a glance at your news feed will show that the key points remain relevant. This Week: Extreme Strength. What Does It Tell Us? 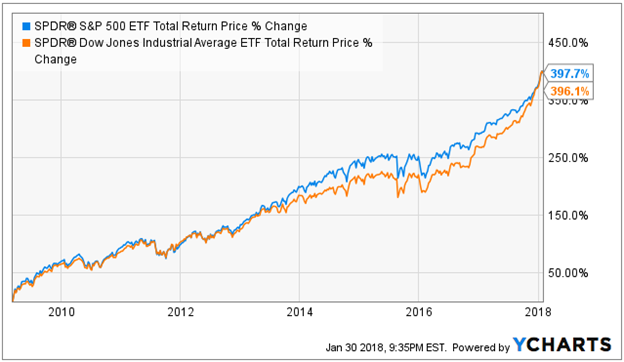 The market has been extremely strong over the last nine years. And by many metrics, we’re now entering very rare territory. 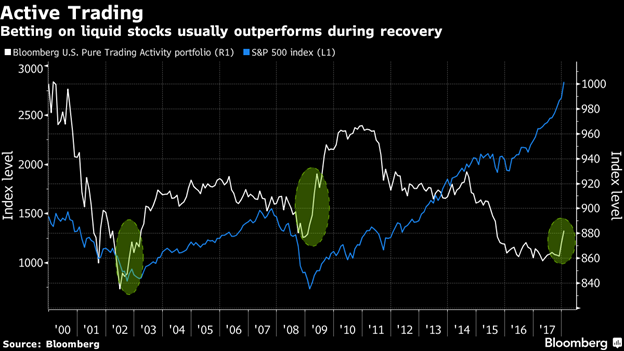 For starters, here’s a look at the total return of the S&P 500 since the depths of the financial crises, up nearly 400%, truly extraordinary. 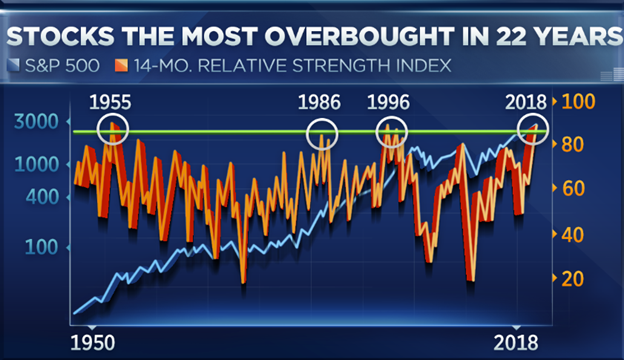 And according to this next chart, stocks (as measured by the S&P 500) recently crossed the most overbought level in 22 years. 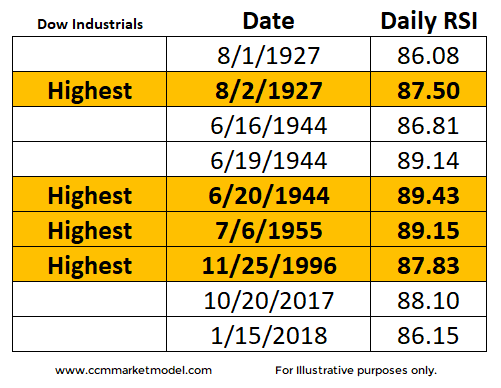 Similarly, Chris Ciovacco points out that the Dow Jones daily RSI recently printed its most overbought reading since 1955, as show in this table. Our trend-following trading models (e.g. Felix, Athena) are more sophisticated than simply RSI, but the continuing momentum in RSI helps explain why these models have been working so well (more on performance later). Most valuation parameters are either the richest ever (Buffett ratio of stock market capitalization to GDP, price-to-sales ratio, the VIX, bond yields, private equity transaction multiples, real estate capitalization ratios) are among the highest in history (p/e ratios, Shiller cycle-adjusted p/e ratio). The U.S. economy is chugging along, and the recovery that started in 2009 has become one of the longest in history (103 months old at this point). The rest of the world’s economies are joining in for that rare thing, worldwide growth. Most economies seem to be gaining rather than losing steam, and they don’t appear likely to run out of it anytime soon. By contrast, our trading models use the 750 most liquid stocks thereby also contributing to their continuing strong performance. But what inferences can traders make from continuing market strength? 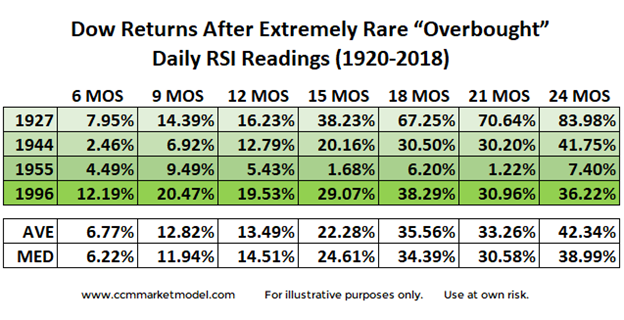 According to the same article by Chris Ciovacco, “after experiencing extremely rare stock market overbought readings, stocks performed very well over the next two years” as shown in the following table. And consistent with continuing market strength, our momentum-based models have been stronger than our dip-buying models; however both continue to deliver strong returns (more on this later). And worth mentioning, another outstanding resource for traders is Brett Steenbarger’s Trading Psychology Resource Center. Dr. Steenbarger’s content is organized, extremely valuable, and goes back for more than a dozen years. 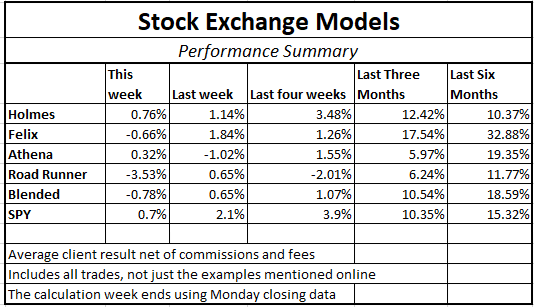 Per reader feedback, we’re continuing to share the performance of our trading models, and the following table shows this week’s update. Important to note, we find that blending a trend-following / momentum model (Athena) with a mean reversion / dip-buying model (Holmes) provides two strategies, effective in their own right, that are not correlated with each other or with the overall market. By combining the two, we can get more diversity, lower risk, and a smoother string of returns. And for these reasons, I am changing the “Trade with Jeff” offer at Seeking Alpha to include a 50-50 split between Holmes and Athena. Current participants have already agreed to this. Since our costs on Athena are lower, we have also lowered the fees for the combination. If you have been thinking about giving it a try, click through at the bottom of this post for more information. Also, readers are invited to write to main at newarc dot com for our free, brief description of how we created the Stock Exchange models. This week’s Stock Exchange is being edited by Blue Harbinger (Blue Harbinger is a source for independent investment ideas). Road Runner: This week I like Adobe Systems (ADBE). Are you familiar with this company, Blue Harbinger? Blue Harbinger: Yes, I am familiar. I know Adobe is more than simply a company that lets me save my documents as a PDF before I send them to someone else so I don’t have to worry about the formatting or content getting messed up. Adobe operates through three segments: Digital Media, Digital Marketing, and Print and Publishing. Why do you like this stock, Road Runner? 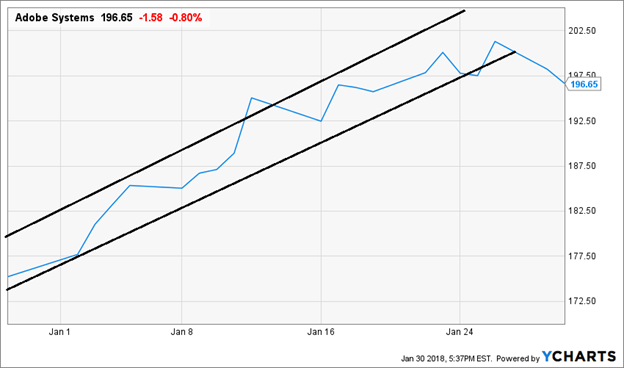 RR: As you know, I like to buy stocks that are at the bottom of a rising channel. And based on the following chart, you can see why I like Adobe. BH: Interesting, Road Runner. I see Adobe’s share price seems to have fallen below this “rising channel” you always talk about. What kind of risk management are you using, if any? RR: You’re right. I purchased this stock on January 26th at the lower end of the channel, and its price did drop a bit in the last few days. I don’t use stop orders like the other trading models, but I do watch it closely. The decline is mostly in line with the market. BH: Hmm. Interesting, Road Runner. Are you aware of how the new tax laws will impact Adobe? Specifically, did you know the company just recently lifted its 2018 earnings guidance to $6.20 from the prior forecast of $5.50 citing recent tax law changes that are expected to significantly lower its effective tax rate? RR: I am aware of the tax law. Did you know my typical holding period is only about 4 weeks, and also that Adobe is tentatively scheduled to announce earnings in a couple weeks on February 15th? BH: I did know that, Road Runner. 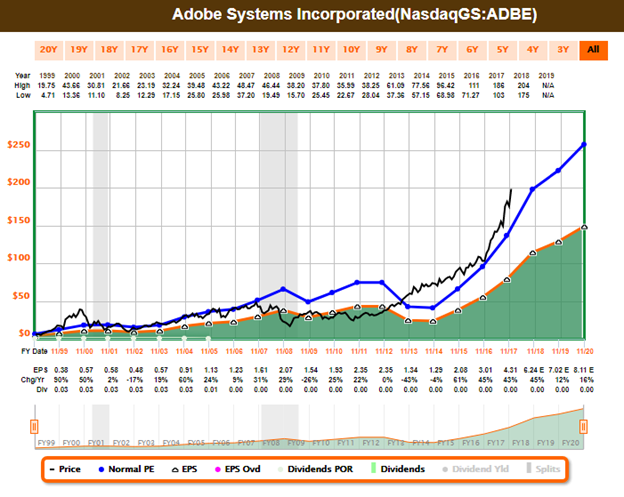 In case you’d like a little more fundamental information about Adobe, here is a look at the company’s Fast Graph. RR: That Fast Graph is showing some strong future upside, but again—I typically hold for only about 4 weeks. How about you, Felix—what have you got this week. Felix: I have no stock picks this week, but I did run the top stocks in the Russell 1000 large cap index through my model, and I’ve included the top 20 in the following list. BH: That’s an interesting list, Felix. I see a lot of the usual aggressive growth suspects on your list, such as payment processing application Square (SQ), chipmaker Nvidia (NVDA) and now cell-based cancer immunotherapies company, Juno Therapeutics (JUNO), is at the top of your list. All those companies have been performing well. Are you nervous that any of them are overbought and due for a correction? Felix: I’m a model, not a person. So no, I am not nervous. Besides, the earlier data in this report shows markets often continue rising for two years after printing extreme overbought levels. And in case you have forgotten, I typically hold my positions for about 66 weeks—which is much longer than the other models. I exit when my price target is hit, and I use stops and macro considerations to control risks. And did you happen to notice my strong performance in the performance table earlier in this report? BH: I noticed, Felix. Nice work. I’m also glad Jeff uses a combination of momentum and dip-buying models, just in case market conditions change. It helps deliver a diversified lower-volatility return stream. How about you, Oscar—what have you got this week? Oscar: This week I’m sharing my top 20 rankings from our comprehensive and diverse ETFs list. 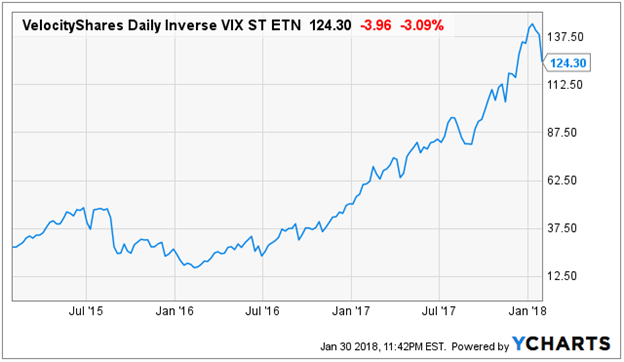 BH: I see the inverse VIX (XIV) is at the top of your list; that’s been a great trade for years because volatility has been disappearing (the VIX is also known as the market “fear index” because it measures expected future volatility). I especially like that trade now because volatility has ticked up in recent trading days (it’s still no where near financial crisis levels), but that uptick seems to make for a more attractie entry point, assuming the market reverts back towards the ongoing longer-term trend. Oscar: I agree, and I suspect you’re right (that’s why XIV is ranked so highly). And in case you’ve forgotten, I am a momentum trader, and my typical holding period is about six weeks. I use stops to protect against downside, and I exit by rotating into another sector. Just because market strength is unusually high doesn’t mean it’s going to change immediately. In fact, historically, the market has remained strong after reaching extreme RSI levels, such as those it has recently achieved. Nonetheless, we prefer to use a blended approach between momentum and dip-buying models in order to reduce risk while keeping expected future returns high. Each week, Felix and Oscar host a poker game for some of their friends. Since they are all traders, they love to discuss their best current ideas before the game starts. They like to call this their “Stock Exchange.” (Check out Background on the Stock Exchange for more background). Their methods are excellent, as you know if you have been following the series. Since the time frames and risk profiles differ, so do the stock ideas. You get to be a fly on the wall from my report. I am usually the only human present and the only one using any fundamental analysis. The result? Several expert ideas each week from traders, and a brief comment on the fundamentals from the human investor. The models are named to make it easy to remember their trading personalities. Readers are welcome to suggest individual stocks and/or ETFs to be added to our model lists. We keep a running list of all securities our readers recommend, and we share the results within this weekly “Stock Exchange” series when feasible. Send your ideas to “etf at newarc dot com.” Also, we will share additional information about the models, including test data, with those interested in investing. Suggestions and comments about this weekly “Stock Exchange” report are welcome.